Ruben Villa (11-0, 4 KOs)–One of the hottest young prospects in boxing right now. In July 2016, the amateur sensation signed with Banner Promotions and Thompson Boxing, and he has quickly established himself as one of the top young fighters in the sport. Villa began back at the age of 5, when family members, who were huge boxing fans, took young Ruben to a boxing gym. He is the second oldest of four sisters and was influenced by Vasyl Lomachenko and Canelo Alvarez. Villa has sparred with many top professionals including world lightweight contender Petr Petrov. In the 2015 U.S. Olympic Trials, Villa narrowly lost to eventual Olympic Silver Medal winner Shakur Stevenson. Villa previously had taken 2 of the 3 bouts he fought against Stevenson. 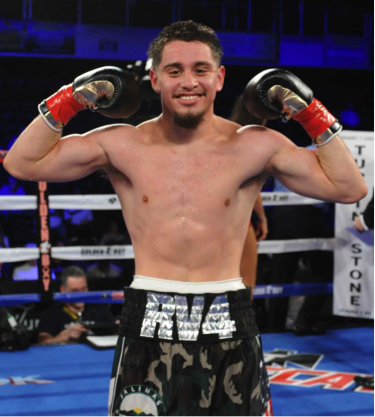 In his professional debut on July 29, 2016 in Ontario, California, Villa did not waste any time putting away challenger Gerardo Molina (1-2, 1 KO). Villa landed a counter left hook early in the first round that sent Molina backpedalling onto the canvas. Seconds later, Villa rocked Molina with a series of punches, knocking him out at the 2:25 mark of the opening round. In his 2nd bout, which took place on September 23, 2016, Villa stopped Jose Mora in the 1st round. In his east coast debut, Ruben stopped Luis Diaz in the 6th round, in a bout thank place on April 14, 2017 at the MGM National Harbor in National Harbor, MD. The bout was featured on the undercard of a Showtime ShoBox event. On July 1, 2017, Villa won a 4 round unanimous decision over veteran Jonathan Alcantara in Sacramento, California. Villa will continue to be active in the ring in 2018 and is expected to achieve world championship greatness in his professional boxing career.